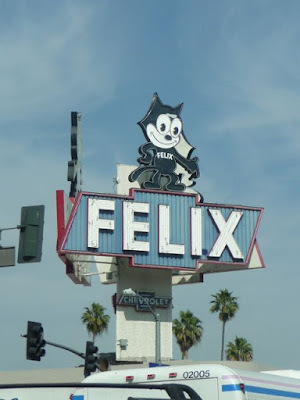 I was over by USC earlier this month for my brother-in-law's graduation when I noticed the huge "Felix Chevrolet" sign across the street from campus. Apparently Felix the Cat sign, created back in 1957, was recently declared a historic landmark by the City of Los Angeles. Great for everybody - except for Darryl Holter, the owner of the Felix Chevrolet dealership. You know, the guy who actually owns this business. They guy who actually employs people . . .
Everyone loves Felix the Cat. But what about the rights of the business owner? July 26, 2007|Darryl Holter, Darryl Holter is dealership operator of Felix Chevrolet. 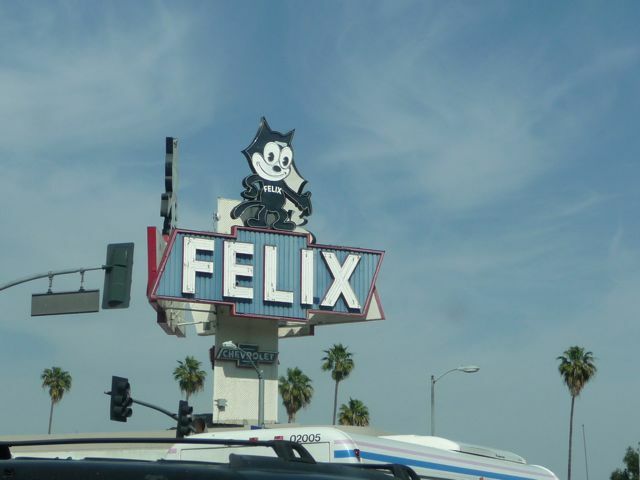 It is commonplace to say that Los Angeles has no historical memory. But that's not quite true. In fact, many older neighborhoods have tried to protect their historical character by voting for historic preservation overlay zones, or HPOZ. Homeowners in such zones need the approval of a review board before changing their houses' exteriors. But what happens in commercial areas when preservation activists impose their will on owner-occupied businesses? Years ago, a friend from Europe reminded me that all the historical buildings in his town's square were actual businesses. His city wasn't a museum or an amusement park. They had to really function. Trying to find that right balance between business and history.